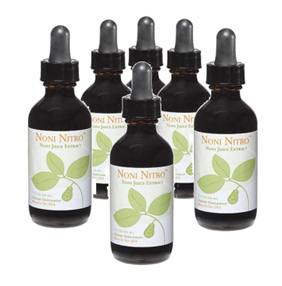 The perfect natural balance of amino acids, enzymes and peptides make Noni Nitro the ideal nutritional supplement for the entire family and it can be taken anytime throughout the day. It's so simple and convenient to use and store that it requires no refrigeration. Noni Nitro can be taken alone, with water, or added to your favorite beverage with or without meals. Take 1 serving, 2-3 times a day. Click here to read a brief pdf concerning the Nobel Prize and other research involving Nitric Oxide. According to the American Diabetes Association, almost 8% of the US population has diabetes over 23 million people. When looking at specific populations these numbers rise: more than 10% of Hispanics and almost 12% of Mexican Americans have diabetes. Research has shown that people with diabetes have a reduced amount of nitric oxide in their bodies. Although it is not yet known why nitric oxide is under-produced in diabetics, supplementing nitric oxide can be very beneficial in the treatment of diabetic symptoms. Click here to read a series of articles concerning diabetes and the positive effects of nitric oxide.